Born on October 9th 1940, John Lennon still remains one of the most significant voices in the music of our times. 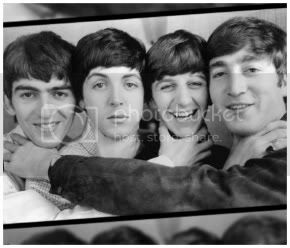 In 1962, John Lennon was still an up-and-coming artist, and though one of two main singer/songwriters at the heart of The Beatles, was scraping by on the little money the band was bringing in at that time. 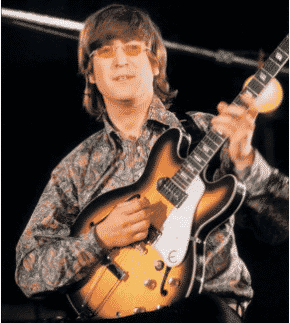 For his first quality American acoustic/electric guitar, Lennon had his sights set on a new Gibson J-160E – the problem was, he didn’t have the money to buy it. 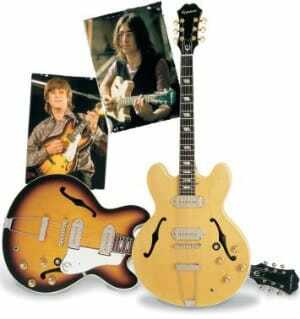 With the aid of a co-signed purchase from Beatles manager Brian Epstein (who also co-signed for band mate George Harrison’s J-160E), Lennon made the guitar his own, and put it straight to the business of making rock and roll history. Each version is an accurate rendition of the Gibson J-160E of 1962, a guitar originally released in 1954 as one of the world’s first successful “electro-acoustic” guitars, with built-in pickup and electronics and ready to hit the stage for the professional performing musician. Beloved by John Lennon, and kept close throughout his too-short life, the 70th Anniversary John Lennon J-160E is a guitar every Beatles fan will want to make their own. The first, finished in Vintage Sunburst and limited to 500 guitars, represents the guitar as it was when Lennon first acquired it and used it on several famous Beatles recordings from 1963 to ’64, including Please Please Me, With The Beatles, and A Hard Day’s Night. Additional specs of the 70th Anniversary John Lennon J-160VS include a 70th Anniversary John Lennon MOP signature on the headstock, 1960s laminated Sitka Spruce top, mahogany back and sides, the classic vintage sunburst lacquer finish, Jumbo 1960s frets, Gibson authentic P-90 pickups, a historic adjustable bridge, and a 70th Anniversary mother-of-pearl engraved 12th fret birthdate of John Lennon. MSRP of the Gibson John Lennon J-160VS is $4728. The second is a stunning Custom Shop “Imagine” model in a Soft White finish personally requested by Yoko Ono to reflect the sentiment of John’s life and music during the recording of “Imagine“. The white Gibson Acoustic “Imagine” model includes an anniversary John Lennon Abalone headstock signature, 70th Anniversary MOP engraved 12th fret birthdate of John Lennon, 1960s laminated Sitka Spruce top, historic Gibson ladder bracing pattern, mahogany back and sides, Jumbo 1960s frets, historic adjustable bridge, Gibson authentic P-90 pickups and a custom hardshell case. MSRP on the Gibson Imagine model is $10,748. The third is the model as it is today, on display at the Rock and Roll Hall of Fame in Cleveland, with a thin, natural finish and John Lennon’s famous “John and Yoko” caricature sketches, representing the appearance of the guitar during the famous Lennon-Ono “Bed-In” peace protests of 1969. The guitar specs of the Gibson Acoustic Lennon Museum J-160E model includes a Gibson Custom Shop label personally signed by Yoko Ono, authentic recreation of John Lennon’s Bed?In Caricature Sketch, 70th Anniversary John Lennon mother-of-pearl headstock signature, 70th Anniversary mother-of-pearl engraved 12th fret birth date of John Lennon, label personally signed by Yoko Ono, 1960s laminated Sitka spruce top, historic Gibson ladder bracing pattern, mahogany back & sides, custom thin lacquer finish, Jumbo 1960s frets, historic adjustable bridge, Gibson authentic P?90 pickup and a Gibson Custom Shop hardshell case. MSRP on the Gibson Museum model is $15,048. Yoko One herself has been quoted as saying , “Remember, each one of us has the power to change the world. 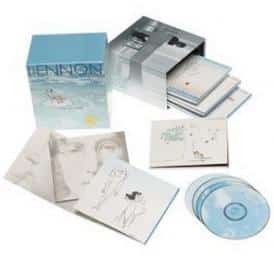 Just start thinking peace and the message will spread quicker than you think.” The Gibson Lennon acoustic models celebrate the peace that has lived on for years through John Lennon’s music and Yoko Ono’s staunch devotion to his memory and legacy. 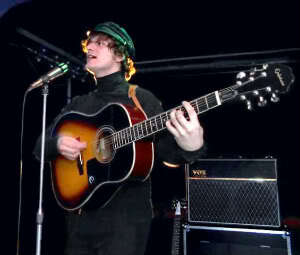 “To say how proud I am of these new John Lennon Anniversary guitars is a huge understatement. The legacy that John Lennon has given music fans around the world is unprecedented and the friendship Gibson continues with Yoko Ono is demonstrated in these remarkable instruments that are in tribute to arguably one of the world’s greatest musicians,” said Henry Juszkiewicz Chairman and CEO of Gibson Guitar. I wished I could play one of those! – I checked out the J-180 and really liked it.